I hereby deem this the Ultimate Japanese New Years Variety Pack! 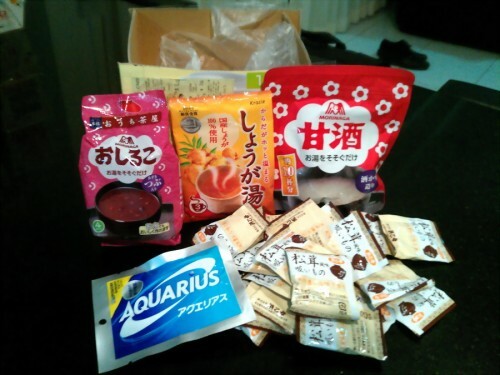 From top left, clockwise: oshiruko (sweet red bean soup), shoga-yu (hot ginger drink), amazake (sweet sake w/curds), matsutake soup packets (awesome with instant noodles), and Aquarius drink powder (for the following day’s hangover). Thanks, Taro! I am looking into getting my hands on equipment to pound our own mochi with from next year.